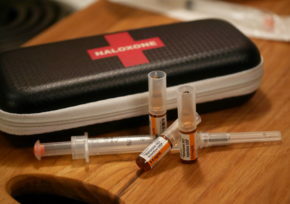 Can occupational first aid attendants administer naloxone? This entry was posted in Roles & responsibilities on 2017/07/19 by Susan. The fentanyl death toll keeps rising. Some B.C. employers now have naloxone on hand for occupational first aid attendants who treat workers and the public. Should employers add naloxone to their emergency response plan? WorkSafeBC has received calls from employers and occupational first aid attendants (OFAs) who want to know if administering naloxone is within the scope of services an OFA can provide, says Dan Westerby, manager of WorkSafeBC’s Certification Services. The answer is yes. It is within the scope of OFA duties to administer naloxone. This drug can save lives by reversing the effects of opioids, including fentanyl. Naloxone is available over the counter, with no prescription needed. In the past, only doctors could administer it. In October 2016, the Health Professions Act and the Emergency Health Services Act were amended so that now anyone can administer naloxone if they are trained to do so. Basically, you stab the needle into a person – right into the thigh muscle, through clothing. It’s like an EpiPen (the device used for life-threatening allergies). In some workplaces – like universities, public buildings, and retail stores – the majority of OFA calls are for members of the public, Dan says. The naloxone is more likely to be used on the public than on workers, and thankfully it is on hand in more and more places. According to the most recent report from the B.C. Coroners Service, fentanyl was detected in 368 (of 511) illicit drug overdose deaths from January through April 2017. Many of these fatal overdoses happened in Vancouver, my hometown. I usually find out about such deaths on Facebook. Yet another person’s daughter, uncle, roommate, or coworker has died from a fentanyl overdose. Grieving loved ones post a stream of condolences and tributes to these lives lost. See WorkSafeBC’s First Aid Advisory: Naloxone for more information about how naloxone may fit into a workplace emergency response plan. The Naloxone Risk Assessment Tool – For non–public sector organizations helps organizations in B.C. to assess whether their staff should carry or stock naloxone to use in the event that employees, clients, or members of the public experience an overdose. You can get a kit (and training) from the Take Home Naloxone Program if you are concerned about family and friends who may be at risk. Parents and mentors, please read this Letter to parents and guardians – talk to your youth about substance use. Please clarify. Per your advisement “… The answer is yes. It is within the scope of OFA duties to administer naloxone. This drug can save lives by reversing the effects of opioids, including fentanyl….”. I disagree, this is not within the scope of the First Aid attendant. The first aid attendant duties are to treat workplace injuries not diagnose symptoms nor administer medication. Very few workplace have dealings with opioids as part of their work duties. If exposure to opioids was present as part of the worker’s duties, then, I could see first attendants administering naloxone. Sorry I do not have my current publication. Thank you for this question. I am looking further into it and will have an answer soon. Naloxone is a non-prescription medication available over the counter at many pharmacies in B.C. The Occupational First Aid (OFA) Reference and Training Manual is clear on the attendant’s scope of practice with respect to meds administration – both Rx and non-Rx meds. The OFA Reference and Training Manual clearly indicates that the OFA attendant may administer some meds. Most workplaces in B.C. will not encounter workers who have overdosed on opioids but they may encounter members of the public who have. Unfortunately, this is something that more and more workplaces are indeed experiencing – depending on where one works. Employers in those workplaces are simply being proactive (schools, malls, airports, sports centres, nightclubs, concert halls, the B.C. legislature, and anywhere else we find large numbers of people gathering – not all workplaces are a mill or a manufacturing plant). In the event that they do encounter a worker or a member of the public who has overdosed on opioids, they’d prefer to have naloxone on hand and they’d prefer that their designated OFA attendant manage the situation. An OFA attendant would be expected to administer meds (including injecting OTC meds, if the OFAA is trained to do so) if the response called for that, and if responding to the public within the workplace, and if necessary administering meds, was in the employer’s written Emergency Response Plan. For example, epinephrine provided by autoinjector (it’s an OTC med) for a person/worker suffering from anaphylaxis or ASA for chest pain associated with a heart attack or nitro, a Rx med prescribed for a person suffering from diagnosed angina. Lastly, refusing to provide treatment to a worker suffering from any illness or injury, regardless of the cause, would generate an investigation if WorkSafeBC is informed of the occurrence. And, if the investigation revealed that the OFAA breached a term or condition of the certificate, it would be grounds for OFA certificate suspension. This opinion seems short sighted and quite inaccurate. As OFA’ s do assist and treat workplace injuries that is a given. But we are required where possible and within our scope to treat and assist in medical emergencies. Diabetic / insulin shock, cardiac arrests and airways obstructed with a ham sandwich are but a few medical emergencies we see regularly. We treat , assist, and transport for medical aid. Not to do so implies a bias against opiate addiction. I prefer to treat all people regardless of my personal bias. Don’s comments are misleading…first aid attendants do indeed treat people with those medical situations, but they do not inject them with medication to help them…that is crossing a line. HOWEVER…yes we should be injecting them if there is a reasonable chance that they are having an opioid situation. As a rule of thumb, if the general public can do it, the FA attendant can do it. Pretty simple. If someone was to experience anaphylactic shock from a bee sting, would you not use their epi-pen? If someone is having a seizure, would you not use their injectable drug regimen?